Swine are highly susceptible to a variety of flu viruses (human, swine, avian) - and are viewed as excellent `mixing vessels’, allowing viruses to reassort into new hybrid strains. Swine Influenza Viruses (SIVs) are not a reportable or regulated animal disease in the United States, but the USDA does conduct limited voluntary surveillance for SIV in the US. Just shy of a year ago, in USDA IAV-S Surveillance Program Detects Novel H3N1 In US Swine, we learned that a new reassortant SIV had been detected in two states. While swine H3N1 has been known to circulate in pigs for nearly a decade (see EID Journal 2006 article Novel Swine Influenza Virus Subtype H3N1, United States) this latest variant was a combination of both human and swine influenza viruses. A review of Genbank data indicates there may be more human-like H3 genes (in either H3N1 or H3N2) circulating in U.S. swine subtypes than what the USDA surveillance data has captured. 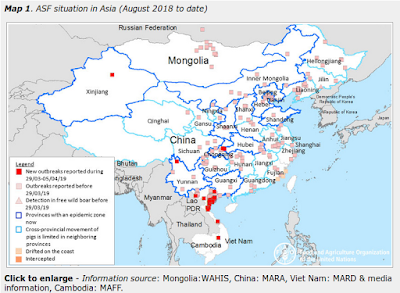 Potential spread of H3N1 or H3N2 that carries the human-like H3 could have significant impact in swine herds due to poor herd immunity as well as potential public health ramifications. Preliminary findings by the USDA-ARS from testing of one of these H3N1 isolates with the human-like H3 gene in swine indicate the virus is fully virulent, causing typical influenza disease. As we saw with the 2009 H1N1 pandemic virus, reassortant influenza viruses can kick around swine herds for years or even decades – picking up mutations or mixing with other viruses – without posing a threat to humans. Most end up evolutionary failures, but every once in awhile, a genetic winner emerges. Over the past decade we’ve been watching a variety of swine variant viruses (H1N1v, H1N2v,H3N2v) making tentative leaps into human hosts, with a new case reported just last Friday. So far, these cases remain sporadic, and human-to-human transmission appears rare. All of which brings us to a new study, published last week in the Journal of Virology (alas, behind a pay wall), that describes two distinct novel reassortants (H3N1 and H3N2) that possess human-like H3, and the internal genes from the 2009 H1N1 pandemic virus. They describe both of these novel subtypes as “. . . virulent and can sustain onward transmission in pigs, and the naturally occurring mutations in the HA were associated with antigenic divergence from H3 IAV from human and swine’” and goes on to warn that ``. . . the potential risk of these emerging swine IAV to humans should be considered”. Novel reassortant human-like H3N2 and H3N1 influenza A viruses detected in pigs are virulent and antigenically distinct from endemic viruses. Rajão DS1, Gauger PC2, Anderson TK1, Lewis NS3, Abente EJ1, Killian ML4, Perez DR5, Sutton TC6, Zhang J2, Vincent AL7. Human-like swine H3 influenza A viruses (IAV) were detected by the USDA surveillance system. We characterized two novel swine human-like H3N2 and H3N1 viruses with HA genes similar to human seasonal H3 strains and the internal genes closely related to 2009 H1N1 pandemic viruses. The H3N2 NA was of the contemporary human N2 lineage, while the H3N1 NA was of the classical swine N1 lineage. Both viruses were antigenically distant from swine H3 viruses that circulate in the U.S. and from swine vaccine strains, and also showed antigenic drift from human seasonal H3N2. Their pathogenicity and transmission in pigs were compared to a human H3N2 with common HA ancestry. Both swine human-like H3 viruses efficiently infected pigs and transmitted to indirect contacts, whereas the human H3N2 was much less efficient. To evaluate the role of genes from the swine isolates on their pathogenesis, reverse genetics-generated reassortants between the swine human-like H3N1 and the seasonal human H3N2 were tested in pigs. Gene segment contribution to virulence was complex with the swine HA and internal genes showing effect in vivo. The experimental infections indicate that these novel H3 viruses are virulent and can sustain onward transmission in pigs, and the naturally occurring mutations in the HA were associated with antigenic divergence from H3 IAV from human and swine. Consequently, these viruses could have a significant impact on the swine industry if they cause more widespread outbreaks, and the potential risk of these emerging swine IAV to humans should be considered. Pigs are important hosts in the evolution of influenza A viruses (IAV). Human-to-swine transmissions of IAV have resulted in the circulation of reassortant viruses containing human-origin genes in pigs, greatly contributing to the diversity of IAV in swine worldwide. New human-like H3N2 and H3N1 viruses that contain a mix of human and swine gene segments were recently detected by the USDA surveillance system. The human-like viruses efficiently infected pigs and resulted in onward airborne transmission, likely due to multiple changes identified between human and swine H3 viruses. The human-like swine viruses are distinct from contemporary U.S. H3 swine viruses and from the strains used in swine vaccines, which could have a significant impact on the swine industry due to lack of population immunity. Additionally, public health experts should consider appropriate risk assessment for these emerging swine H3N1 for the human population. While avian influenza has been getting the bulk of our attention the past couple of years, swine influenza viruses – while usually less virulent - are also worrisome because they probably have less of a `leap’ to make in order to adapt to human physiology.